The world is your canvas. This is your space. 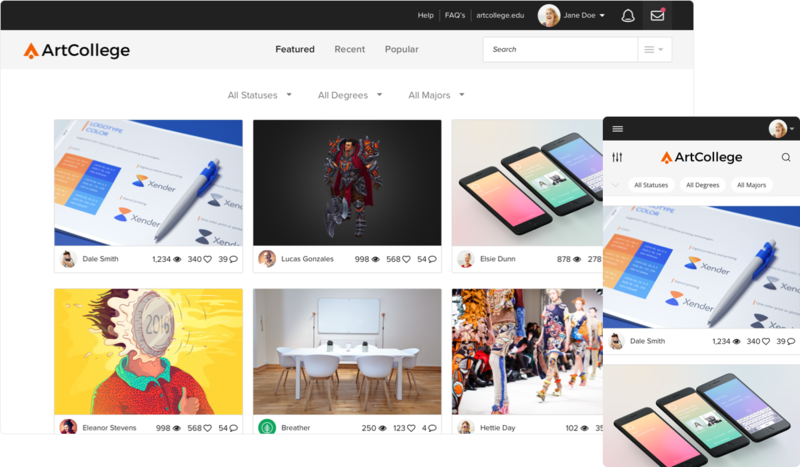 Canvaspace is a white label portfolio networking platform where artists can post, promote, and discover creative work. Canvaspace serves the higher education space by providing a platform for students and graduates to showcase their work and gain exposure. 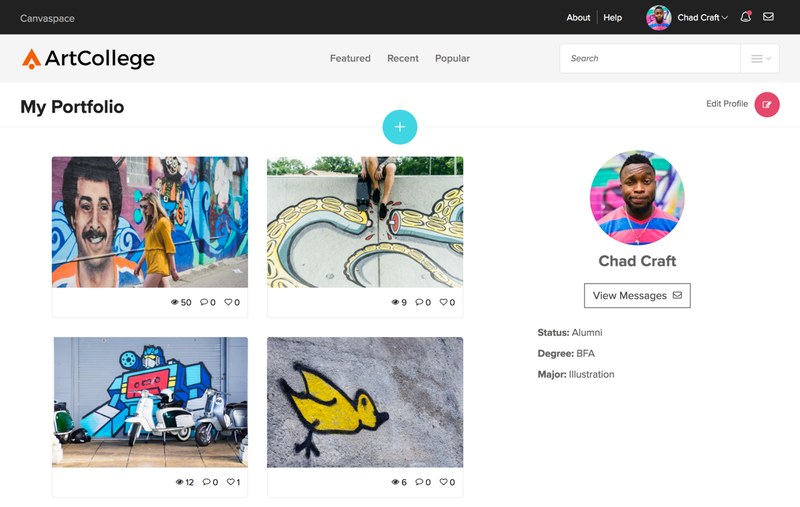 With seamless third-party integration and a social atmosphere, Canvaspace also helps students market themselves to potential employers. In our previous work with an art college, we realized that students were not equipped with the right tools to prepare them for life after graduation. These students had incredible talent, but no effective means to reach employers. 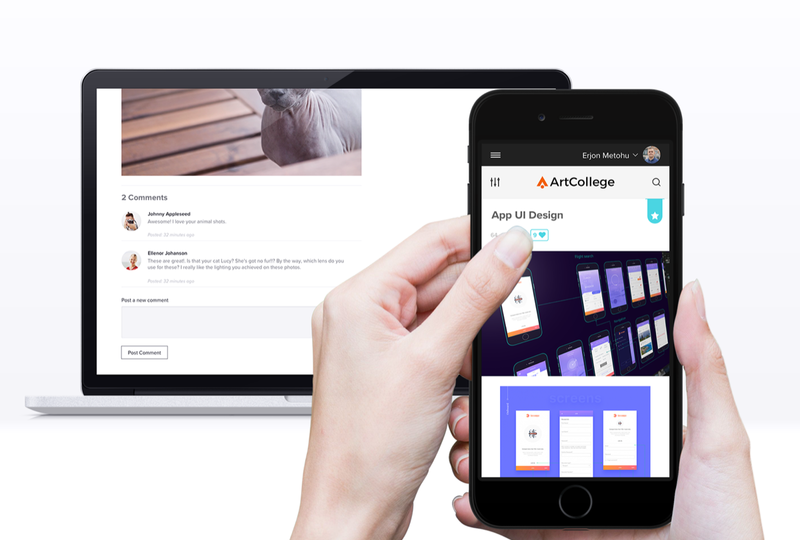 We designed Canvaspace to pave the way for students to become professionals, but it also acts as a social outlet to increase engagement. Through our conversations with art schools, we arrived at a design that was both functional and beautiful. 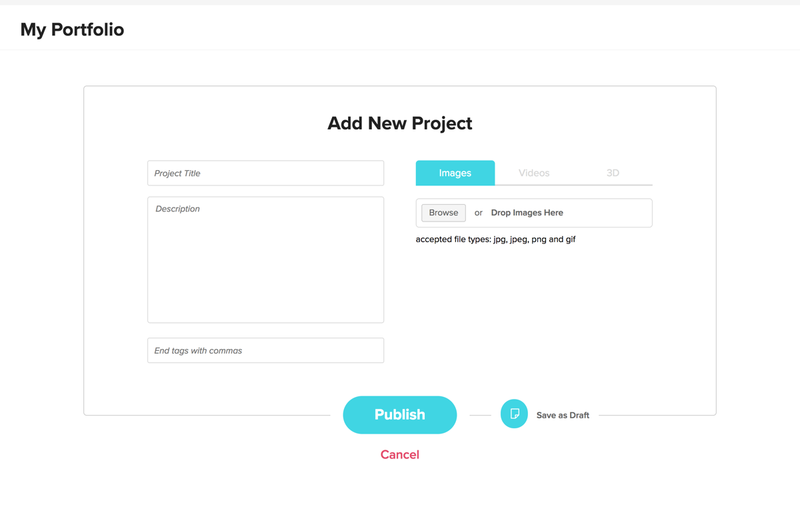 Projects are laid out cleanly and can be sorted through featured, recent, or popular tabs. While on a project page, you can like, comment, or share to other media outlets to circulate your work. With Canvaspace, you have the option to refine your search through filters that are completely modifiable by school admins. You can also search a keyword or simply click a tag that’s on a project. Whether you’re just browsing or you know exactly what you want, you’ll find what you’re looking for. Every art institution is different. So why should Canvaspace look the same? 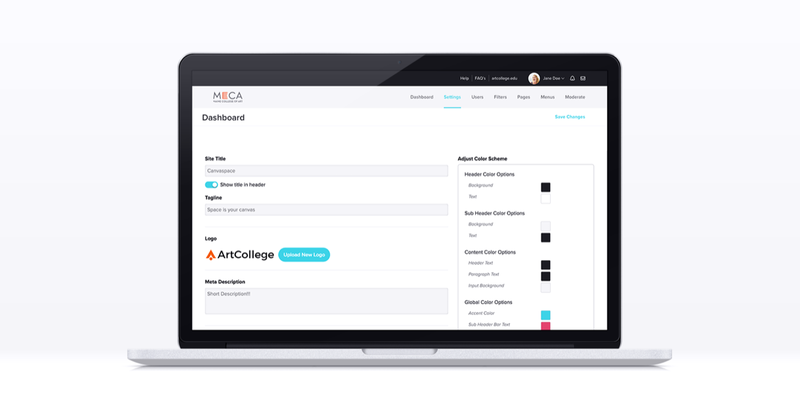 We give administrators the ability to fully customize their portfolio site with their school’s own domain, colors, logo, and content. 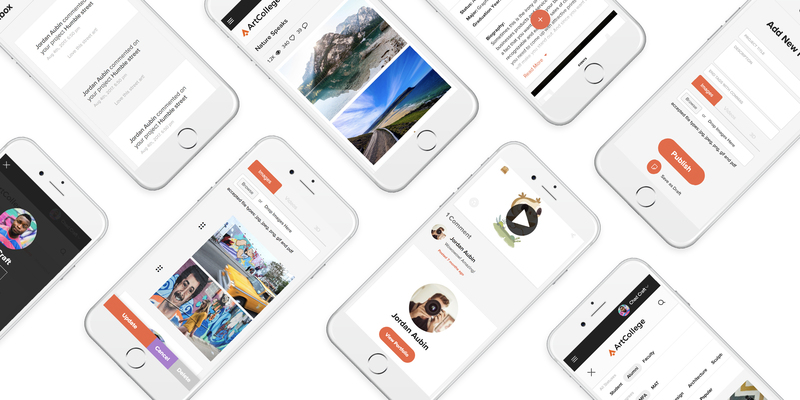 Make Canvaspace your own to give users a truly personal experience. Admins can set email address requirements, set user roles, and add or remove filter options with just a few clicks. 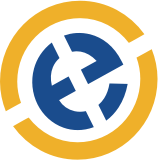 Admins also have the ability to enable project moderation and accept or unlist any project. 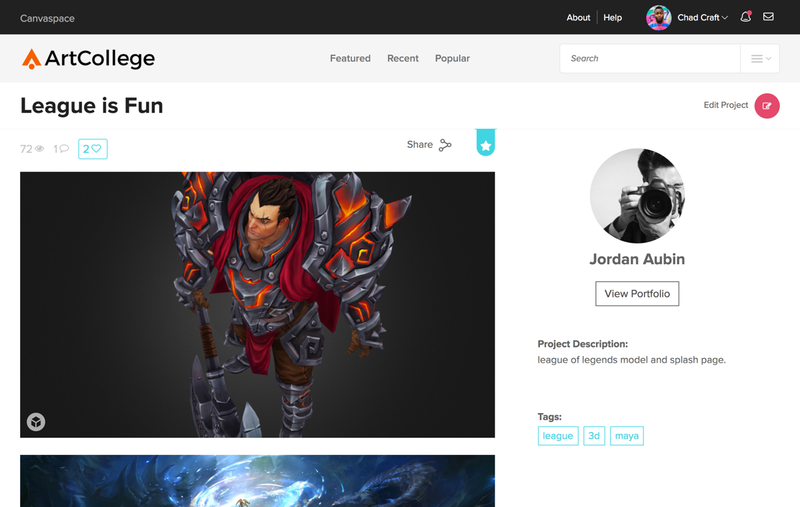 Unlisted projects are only visible on a user’s profile and don’t appear on the featured, recent, or popular tabs. No tool is complete without proper analytics. See all the data you need right within the administrator dashboard. 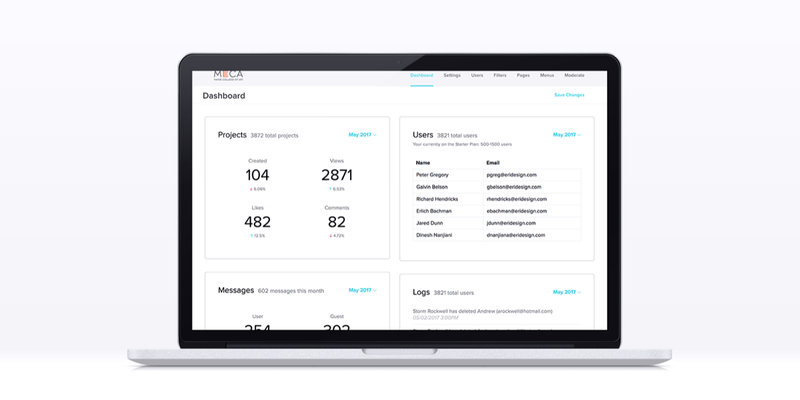 You can track projects created, project views, likes, comments, users and messages. The analytics dashboard is the one-stop destination for admins to gauge student activity. When they aren’t working on projects, artists are often out and about, finding inspiration. With this in mind, we made sure Canvaspace is fully responsive and compatible with whatever device you carry on you. On mobile devices, Canvaspace looks and functions just as beautifully as it does on desktop.